Nashville, TN - Big Machine Label Group's rising country star Brett Young's self-titled debut LP was released February 10th, 2017. 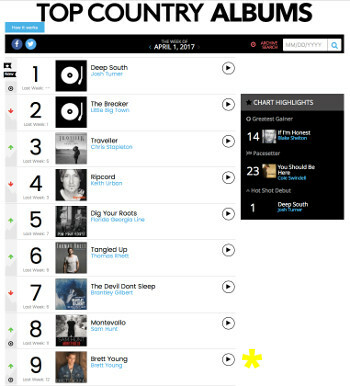 The album features #1 country radio hit "Sleep Without You" as well as rising chart topping single "In Case You Didn't Know". Track #11, "Beautiful Believer" was co-written by Brett, Jason Adamo and Annie Wildgen. Brett's growing fan-base has adopted the song title as their un-official calling card "Beautiful Believers". The song is Adamo's first major label cut as a songwriter.